This Shunammite woman, who is never named, was generous and hospitable, particularly toward the things of God. She noticed this "holy man of God" (Elisha) and wanted to make a connection. Invitations to meals when he passed through Shunem led to B&B accommodation. What rewards she got for this! After Elisha asked how he could repay her (with no request on her part, but Elisha's servant Gehazi observing that she was childless), she and her husband had a son. Beyond the bounds of today's reading, her young son died. Then she went in desperation to the prophet and Elisha brought the boy back to life (2 Kings 4:18-37). Later Elisha warned her and her husband of a coming famine so they could move to a place where there was food (2 Kings 8:1,2). After seven years she and her family returned to Israel where, it appears someone had confiscated the family's property. 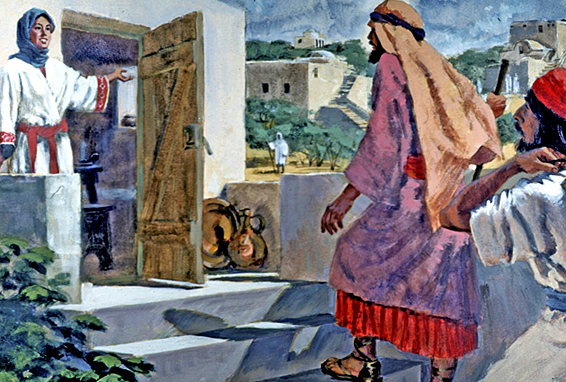 She went to the king to ask that it be returned to them—and at exactly the time that Gehazi was telling him about Elisha raising her son from the dead. After that 'coincidence' how could the king not grant her request (2 Kings 8:3-6)? Like the Shunammite woman, we have no idea the things we set in motion when we are generous and hospitable, in terms of rich relationships, future help, even God-engineered coincidences. And with the devious, You will show Yourself shrewd" - Psalm 18:25,26 (emphasis added). PRAYER: Dear God, please help me to nurture qualities of generosity and hospitality, not with a view to getting something in return but simply because these are things You value,. Amen.